Native American Tribes File Lawsuit Seeking To Invalidate Keystone XL Pipeline Permit The Fort Belknap Indian Community and the Rosebud Sioux Tribe contend there was no effort to study how the 1,200-mile pipeline project could affect their water systems and sacred lands. President Trump, flanked by Commerce Secretary Wilbur Ross (left) and Energy Secretary Rick Perry (right), announces the approval of a permit to build the Keystone XL pipeline, in March 2017. In a new bid to stop the Keystone XL pipeline, two Native American communities are suing the Trump administration, saying it failed to adhere to historical treaty boundaries and circumvented environmental impact analysis. As a result, they are asking a federal judge in Montana to rescind the 2017 permit and block any further construction or use of the controversial pipeline. The Fort Belknap Indian Community of Montana and the Rosebud Sioux Tribe of South Dakota contend there was no effort to study how the 1,200-mile pipeline project through their respective territories would affect their water systems and sacred lands. As NPR's Bill Chappell reported, in 2015, the State Department, which has jurisdiction over transnational oil pipelines, "rejected a permit for the Keystone XL pipeline." The following year, President Barack Obama "ordered work halted on the Dakota pipeline after Native American groups and other activists protested its route near culturally sensitive sites in North Dakota." But shortly after taking office, President Trump approved the construction of the Dakota Access project and, on the same day, invited TransCanada — the Canadian company that owns Keystone — to reapply for a permit. Less than two months later, the State Department greenlighted the project, paving the way for construction to begin as early as this summer. By comparison, lawyers for the tribes noted that the State Department's review process for TransCanada's first permit application in 2008 took 1,216 days, while the second took 1,280 days. During a signing ceremony in the Oval Office, Trump proclaimed the proposed pipeline project was "part of a new era of American energy policy that will lower costs for American families and very significantly reduce our dependence on foreign oil and create thousands of jobs right here in America." As NPR's Jeff Brady and Jason Slotkin reported, "The oil industry and some labor unions have supported the pipeline, largely for the thousands of construction jobs it would provide. But those jobs are temporary. The State Department has estimated that once built, the pipeline will employ about 35 people." In a statement issued on Monday by the tribes' attorneys, the Native American Rights Fund, said that prior to granting the Alberta-based energy company's permit, there was no change in its application, which had been twice denied. "There was no analysis of trust obligations, no analysis of treaty rights, no analysis of the potential impact on hunting and fishing rights, no analysis of potential impacts on the Rosebud Sioux Tribe's unique water system, no analysis of the potential impact of spills on tribal citizens, and no analysis of the potential impact on cultural sites in the path of the pipeline, which is in violation of the National Environmental Policy Act, and the National Historic Preservation Act." A State Department spokeswoman said the agency had no public response to the lawsuit, according to The Associated Press. 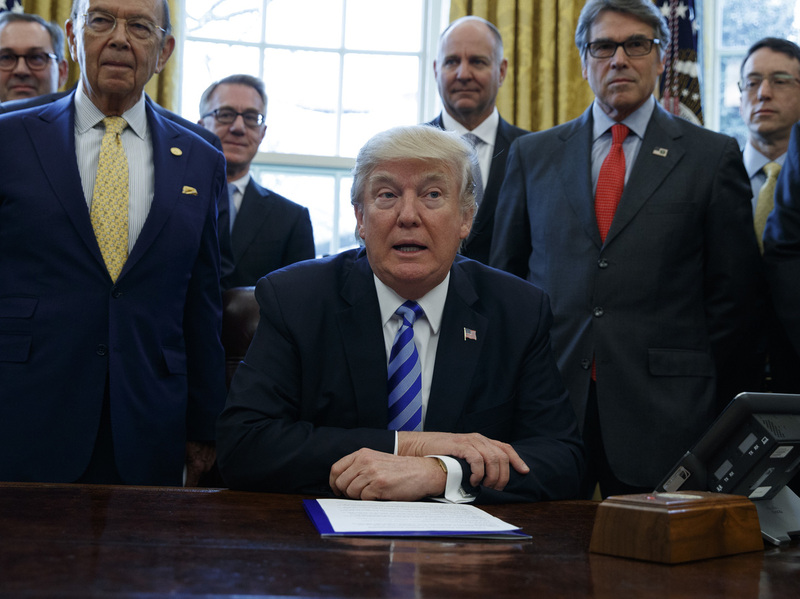 On the day Trump approved the Dakota Access pipeline, he touted two other decrees he signed at the time, saying they would serve to expedite environmental reviews and approvals for "high-priority infrastructure projects" and streamline "the incredibly cumbersome, long, horrible permitting process and reducing regulatory burdens for domestic manufacturing." The Keystone XL project would cut diagonally from Hardisty, Alberta, through Montana and the borders of South and North Dakota to connect to the Keystone Pipeline in Steele City, Neb. It is expected to carry up to 830,000 barrels of crude oil along the 1,204-mile route. The Fort Belknap Indian Reservation is home to nearly 8,000 members of the Gros Ventre (Aaniiih) and the Assiniboine (Nakoda) tribes. According to court documents, "The proposed Pipeline will cross the ancestral lands, sacred sites, and historic sites of the tribes of Fort Belknap." Meanwhile, the Rosebud Indian Reservation in South Dakota is home to the Sicangu Oyate, a branch of the Lakota people. The lawsuit says, "Almost 35,000 members, many of whom reside in the area that will be crossed by the Pipeline, including in Tripp County, South Dakota." Among the many dangers the tribes fear is contamination caused by rupture or spill from the pipeline. The lawsuit cites three such instances stemming from the existing Keystone Pipeline in North Dakota, South Dakota and Nebraska. In August, U.S. District Judge Brian Morris of Montana — the same justice who will be ruling on the Rosebud and Fort Belknap case — ordered the State Department "to conduct a more thorough review of the Keystone XL pipeline's proposed pathway after Nebraska state regulators changed the route," The Rapid City Journal reported.